I am taking the 100 Day Writing Challenge and hope others will join with me. Author Melanie Rocket has challenged herself and other writers to a 100 Day Writing Challenge. Who wants to do this with me? ​For details and to accept her challenge, visit her site at http://melanierockett.com/100-day-writing-challenge. I will also chronicle my 100 days and hope you will add comments about the progress of your challenge here. I am also extending the challenge to 100 days of ANYTHING. Do you want to work out for 100 days straight? Or, eat healthy or give up sugar? Do you have another creative passion that you have been putting off for lack of time? Now is that time! Coincidently, I heard about the 100 Day Challenge RIGHT after I had written a blog posting about long distance runner Stu Middleton. 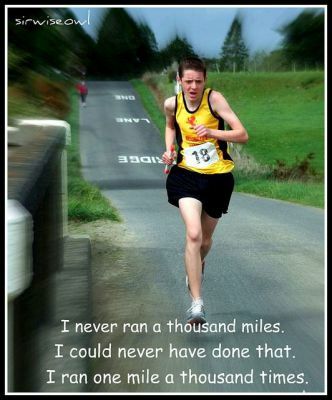 When he broke the world record for the 1000 Mile Run (and you read that correctly, 1000 miles, not 100 which still seems crazy), he replied: I never ran a thousand miles. I could never have done that. I ran one mile a thousand times. The timing is not lost on me. The premise behind my blog and this challenge is to break down things that SEEM impossible into small, manageable pieces. Start (and focus) on just one step, and then keep going one step at a time. Sooooo. . . . . . . are you ready? Are you with me? What's your challenge? Please share with me your goal and check back often to share your progress. I will be posting everyone's feedback, goals, and progress.